The utility pole at La Grange that broke in half when the car from which Julian Batson was rescued reportedly slammed into it. 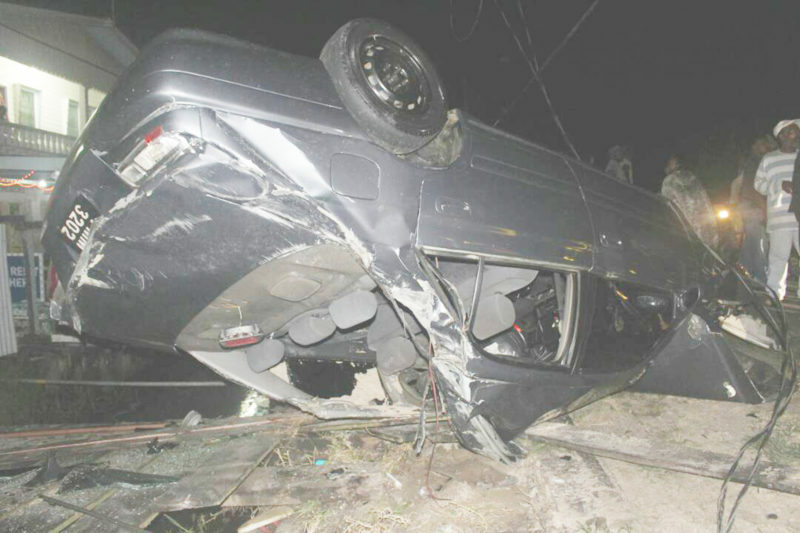 At least three men were last evening rushed to the hospital after two separate but purportedly related vehicle crashes on the West Bank Demerara. The first incident was said to have occurred around 9 pm at La Grange, and involved a silver grey car bearing license plate PMM 3202 reportedly driven by Julian Batson. 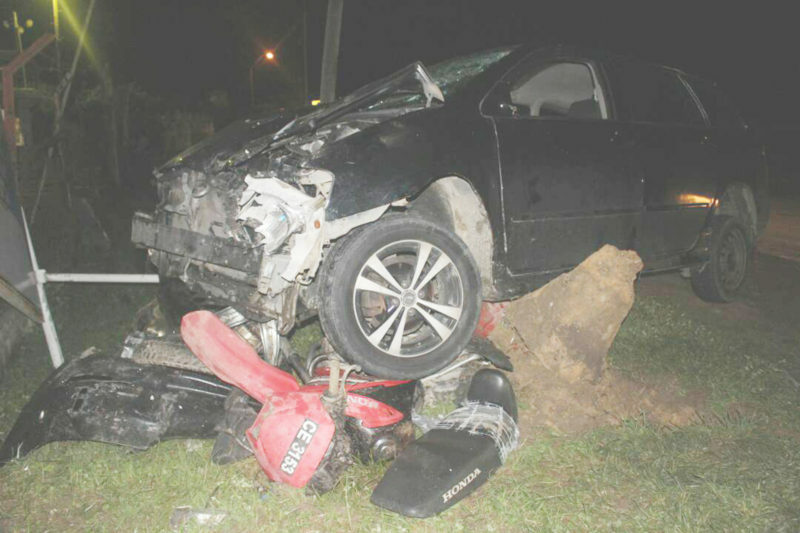 The second incident, which involved a black Fielder wagon and a motorcycle occurred less than 15 minutes later in the vicinity of the Goed Fortuin Power Plant; the identities of that driver and the motorcyclist were unknown up to press time last night. The car from which Julian Batson was rescued at La Grange last evening. 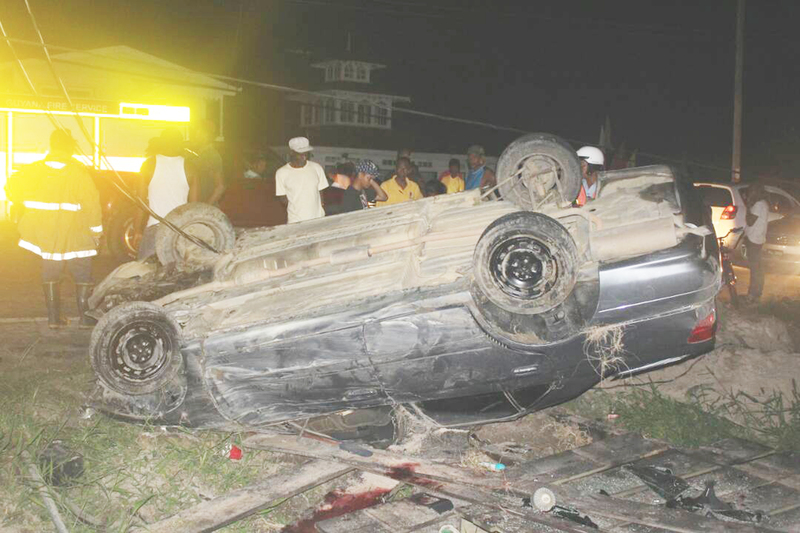 On arrival at the scene of the first accident, Stabroek News received several varying accounts of what had transpired. A number of persons on the scene claimed that the driver of the vehicle was speeding when he encountered the turn and lost control, other reports were that two cars were racing when one slammed into a utility pole, breaking it in the process before finally landing on its roof on a bridge. Occupants of the house whose bridge the car landed on said they did not see what had happened, but were alerted by the impact. A female occupant of the house said she thought something had hit the car parked in her yard, and rushed outside to find a badly damaged car on her bridge. She said she heard cries of someone calling for help and within minutes, several persons came out and assisted in lifting the vehicle to allow the rescue of Batson who was reportedly pinned underneath it. The occupants of the house could not say whether Batson had been driving the car at the time of the incident, but they said based on what they saw he appeared to have been badly injured. 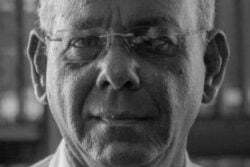 Stabroek News has subsequently informed that Batson had sustained injuries to the head and was taken to the West Demerara Regional Hospital. 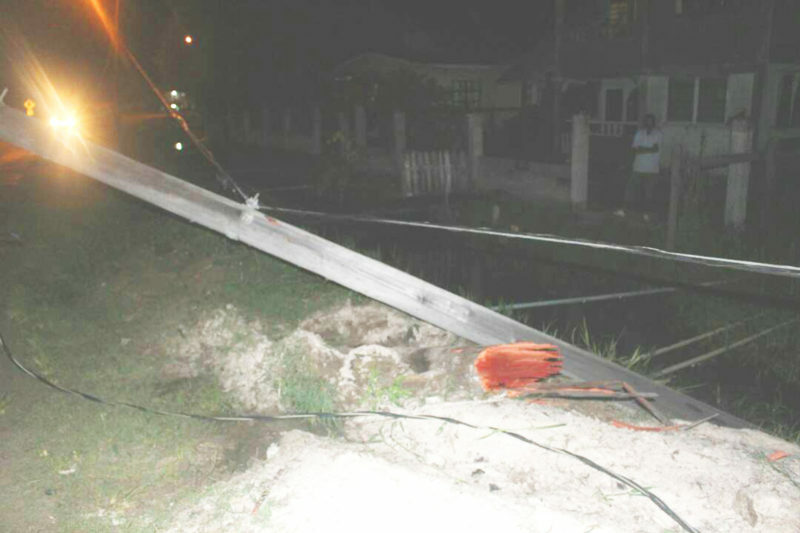 Meanwhile, when Stabroek News arrived at the second crash scene the black Fielder wagon was positioned halfway through the power station’s fence; underneath it was a badly damaged motorcycle bearing license plate CR 3153. 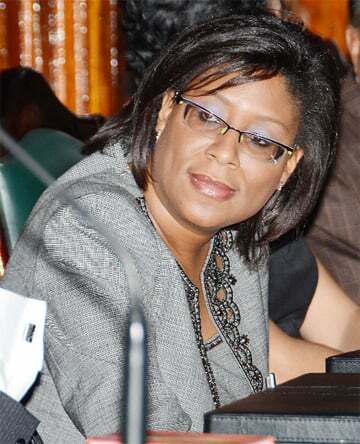 Several persons who claimed that they did not know what had transpired, were seen removing the car’s mirrors and licence plate before police arrived on the scene. Asked if they knew the drivers involved in the accidents, they said both men were friends of theirs and were also friends with each other since they reportedly operate along the same route. 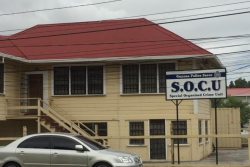 Stabroek News was later able to confirm with another bystander that there were empty alcoholic beverage bottles on the floor of the vehicle. However, up to press time last night this newspaper was unable to confirm how many persons were in the car at the time of the crash, as well as the condition of those involved.